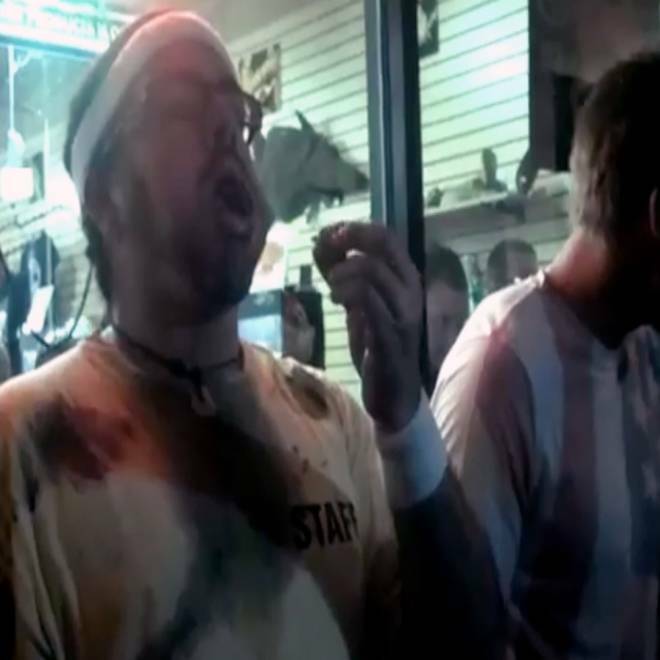 This frame grab made from video on Oct. 5 shows Edward Archbold competing in a roach-eating contest at Ben Siegel Reptile Store in Deerfield Beach, Fla. It could be weeks before autopsy results can determine why a 32-year-old Florida man collapsed and died after winning a cockroach-eating contest. Insect experts say the mere act of eating roaches, while repulsive to many, shouldn’t have killed Edward Archbold. Some theorize Archbold may have had an allergic reaction. Archbold ate more than 60 grams of meal worms, 35 three-inch-long “super worms” and part of a bucket full of discoid roaches to win the “Midnight Madness” bug-eating competition Friday night at Ben Siegel Reptiles in Deerfield Beach, about 40 miles north of Miami, according to The Miami Herald. The take-home grand prize was a python from the reptile shop. Shortly after winning the contest, Archbold became ill and began to vomit, the Broward County Sheriff’s Office said. He collapsed in front of the store and was later pronounced dead at a hospital. The medical examiner's office said Tuesday that it has sent samples of Archbold's remains for testing, but results are not expected for another week or two. Mike Tringale, vice president of external affairs at the Asthma and Allergy Foundation of America, told The Associated Press it's possible that Archbold "hit his tolerance level to cockroach allergens" and went into anaphylactic shock. Tringale said that such a severe reaction to cockroaches is "probably rare," however. Coby Schal, a North Carolina State University entomologist, also surmised that the death was likely an allergic response, "but there is always a possibility that cockroaches do carry bacteria, but the response won't be immediate. It would take time for bacteria to be a problem." Michael Adams, professor of entomology at the University of California at Riverside, says he's never heard of someone dying after consuming roaches. "Unless the roaches were contaminated with some bacteria or other pathogens, I don't think that cockroaches would be unsafe to eat," Adams told the AP. "Some people do have allergies to roaches, but there are no toxins in roaches or related insects." The Broward County medical examiner's office said Tuesday it has sent samples of Archbold's remains for testing, but results are not expected for another week or two. All the contestants in the bug-eating competition had signed a waiver acknowledging the risks of illness, adverse reactions and injury associated with eating live insects, the store said. The live discoid roaches were brought out for the final round of the contest. Luke Lirot, an attorney representing Ben Siegel, the store’s owner, told the Herald that the roaches, which are sold as reptile feed, are “raised in a sterile container from the time they’re little critters" and are perfectly safe to eat. Sarah Bernard, an entomology student at the University of Florida, shot cellphone video of Archbold during the competition. Bernard said she did not see Archbold immediately after the competition ended. She recalled that an announcer said "the winner was vomiting somewhere, and we'll congratulate him when he comes back," according to the AP. Ben Siegel Reptile Store said the prize python, reportedly worth $850, will go to Archbold's estate. Archbold's co-workers at Busch Canvas, which does canvas work for yachts and restaurants, have set up a fund for his daughter, who will turn 7 years old next week, the Palm Beach Post reported. Archbold’s death has officials at Six Flags Great America in Chicago reviewing whether to continue with its “Friday Night Feast,” a weekly contest that invites guests to eat five Madagascar hissing cockroaches, the Chicago-Sun-Times reported. NBC News' James Eng and The Associated Press contributed to this report.